A team of astronomers from the University of Cambridge have identified nine new dwarf satellites orbiting the Milky Way, the largest number ever discovered at once. The findings, from newly-released imaging data taken from the Dark Energy Survey, may help unravel the mysteries behind dark matter, the invisible substance holding galaxies together. The new results also mark the first discovery of dwarf galaxies - small celestial objects that orbit larger galaxies - in a decade, after dozens were found in 2005 and 2006 in the skies above the northern hemisphere. 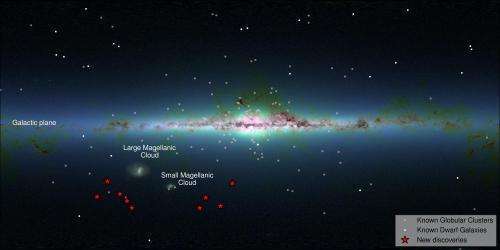 The new satellites were found in the southern hemisphere near the Large and Small Magellanic Cloud, the largest and most well-known dwarf galaxies in the Milky Way's orbit. 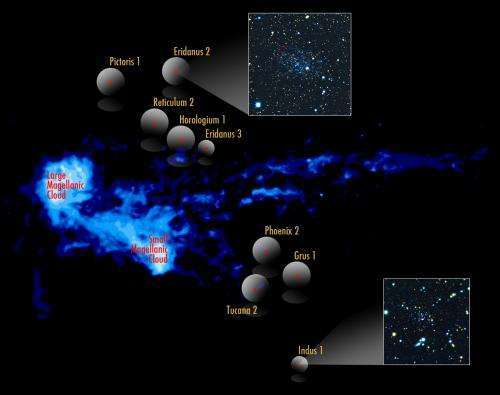 The Cambridge findings are being jointly released today with the results of a separate survey by astronomers with the Dark Energy Survey, headquartered at the US Department of Energy's Fermi National Accelerator Laboratory. Both teams used the publicly available data taken during the first year of the Dark Energy Survey to carry out their analysis. The newly discovered objects are a billion times dimmer than the Milky Way, and a million times less massive. The closest is about 95,000 light years away, while the most distant is more than a million light years away. 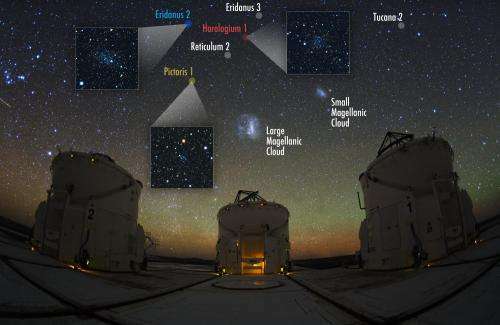 According to the Cambridge team, three of the discovered objects are definite dwarf galaxies, while others could be either dwarf galaxies or globular clusters - objects with similar visible properties to dwarf galaxies, but not held together with dark matter. "The discovery of so many satellites in such a small area of the sky was completely unexpected," said Dr Sergey Koposov of Cambridge's Institute of Astronomy, the study's lead author. "I could not believe my eyes." Dwarf galaxies are the smallest galaxy structures observed, the faintest of which contain just 5000 stars - the Milky Way, in contrast, contains hundreds of billions of stars. Standard cosmological models of the universe predict the existence of hundreds of dwarf galaxies in orbit around the Milky Way, but their dimness and small size makes them incredibly difficult to find, even in our own 'backyard'. "The large dark matter content of Milky Way satellite galaxies makes this a significant result for both astronomy and physics," said Alex Drlica-Wagner of Fermilab, one of the leaders of the Dark Energy Survey analysis. Since they contain up to 99 percent dark matter and just one percent observable matter, dwarf galaxies are ideal for testing whether existing dark matter models are correct. Dark matter - which makes up 25 percent of all matter and energy in our universe - is invisible, and only makes its presence known through its gravitational pull. "Dwarf satellites are the final frontier for testing our theories of dark matter," said Dr Vasily Belokurov of the Institute of Astronomy, one of the study's co-authors. "We need to find them to determine whether our cosmological picture makes sense. Finding such a large group of satellites near the Magellanic Clouds was surprising, though, as earlier surveys of the southern sky found very little, so we were not expecting to stumble on such treasure." The closest of these pieces of 'treasure' is 97,000 light years away, about halfway to the Magellanic Clouds, and is located in the constellation of Reticulum, or the Reticle. Due to the massive tidal forces of the Milky Way, it is in the process of being torn apart. The most distant and most luminous of these objects is 1.2 million light years away in the constellation of Eridanus, or the River. It is right on the fringes of the Milky Way, and is about to get pulled in. According to the Cambridge team, it looks to have a small globular cluster of stars, which would make it the faintest galaxy to possess one. "These results are very puzzling," said co-author Wyn Evans, also of the Institute of Astronomy. "Perhaps they were once satellites that orbited the Magellanic Clouds and have been thrown out by the interaction of the Small and Large Magellanic Cloud. Perhaps they were once part of a gigantic group of galaxies that - along with the Magellanic Clouds - are falling into our Milky Way galaxy." The Cambridge research, funded by the European Research Council, will be published in The Astrophysical Journal. Merger maniacs spreading their fantasy again like wildfire. Even citing the mythical particle as justification. What about the kitchen sink? Want to toss that in too? Fascinating work; thanks! If we could only find a way to capture even a smidgen of dark matter, we could perhaps harness it to stabilize gravity on Mars and make life much easier to live up there.